Oceanbleau, a luxury condominium project in Hollywood Beach that was announced last month, has just launched sales. 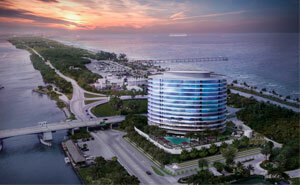 Developer Maxwelle Real Estate Group brought on Miami-based BH3 Realty to handle all sales for the project. The brokerage is a sub-division of development firm BH3, which specializes in multi-family buildings, according to a release. Located at 6085 North Ocean Drive, the tower will house 48 units that range in size from 3,000 square feet to 6,000 square feet, with three- to five-bedroom units. Prices start at $1.6 million. The developer said all units will have views of both the ocean and the Intracoastal Waterway and floor-to-ceiling windows throughout. Also included are European kitchens, concealed cabinetry, wine storage, and marble master bathrooms with separate spa tub and shower. Oceanbleau is slated for completion in December 2016.